Sri Lanka has achieved a relatively high level of health, despite being classified by the World Bank as a lower-middle-income economy. In 2015, the life expectancy for women and men was 78.6 years and 72.0 years, respectively. The neonatal, infant and under-5 mortality rates were 6.59, 9.16 and 10.0 per 1000 live births, and the maternal mortality ratio was 32.0 per 100 000 live births, with almost all labours being attended by a skilled provider and 94.6% of all live births taking place in a government hospital. The country achieved many of the Millennium Development Goals at the national level and has eliminated malaria, filariasis, polio and neonatal tetanus, and controlled rubella. However, Sri Lanka’s achievements in health to date are threatened by increasing health demands associated with the rising burden of noncommunicable disease (NCD) and the growing population of elderly and disabled citizens. Sri Lanka has one of the fastest ageing populations in the world, coupled with a high rate of premature mortality from NCDs. In 2015, the World Health Organization (WHO) STEPwise approach to Surveillance (STEPS) survey of NCD risk factors estimated that 7.4% of adults either had raised blood glucose or were currently on medication for diabetes; 24.6% of men and 34.3% of women were overweight or obese; only 26.9% of men and 28.0% of women were consuming five or more servings of fruits and/or vegetables per day; 30.7% of adults had never had their blood pressure measured by a doctor or health worker; and 42% of the adults with raised blood pressure (>140/ 90 mmHg) were not on any medication. All citizens have access to free health care, through a system that has evolved since the late 1920s, based on a firm foundation of primary health care. The government health-care delivery system covers the entire island and comprises two streams of primary care services – preventive community health care and primary curative care. In common with other low- and middle-income countries, this system was put in place mainly to provide services for maternity care, child health and communicable diseases. The preventive stream of primary health care is organized to cover specific territories, administrative divisions or populations. Curative primary medical care is provided via an extensive network of two types of institutions. First, primary medical care units are relatively basic facilities staffed by medical officers that provide outpatient consultations and host field centres for immunizations, family planning and maternal care. The second type is divisional hospitals, which provide the same services as primary medical care units but with some inpatient facilities plus nursing and possibly laboratory staff. These institutions usually include healthy lifestyle centres for the screening of selected NCDs, such as hypertension and diabetes, and health education. Notably, unlike the preventive services, there are no boundaries for patients accessing curative institutions. Patients can chose freely which provider of curative care – from primary care medical unit to tertiary care facilities – they attend when sick. There is no requirement for patients to register and institutions are not responsible for a defined population or area. Patients commonly prefer to bypass primary care institutions, which often lack standard essential services, in favour of tertiary facilities. This situation means there is a lack not only of gate-keeping but also of accountability for patient care within any defined population or area. During the past decade, it has been recognized that business as usual is not an option for Sri Lanka and that the health system needs to change to sustain its gains and progress towards universal health coverage. Specifically, the combination of an ageing population and increasing burden of NCDs required reorientation and reorganization of the otherwise historically successful health system, with development of service-delivery models focused more on disease prevention and health promotion, and on care more than treatment. This has required a paradigm shift in approach, design and service delivery. advocacy to encourage the people to manage their own health care and to use primary health-care services. The plan underscored the pivotal roles of the “family doctor” and the “shared care cluster”, allowing these key elements of the reformed primary health-care structure to gain traction. In the shared care cluster system, the cluster comprises an apex institute, providing specialist investigations and treatment, together with the geographically surrounding primary care curative divisional and primary medical care units. The cluster provides a continuum of care between primary and specialist services. Thus, both the responsibility for the care of an individual patient and the resources required are shared between the different levels of care, to optimize the availability and utilization of services. In 2018, the Cabinet approved the Policy on healthcare delivery for universal health coverage. The strategic directions in the policy for universal health coverage include the reorganization of health-care delivery to a nationwide network of shared care clusters; strengthening human resources at primary-level curative institutions, including provision of one family doctor per 5000 population, and allied health-care workforce cadres, including public health nurses; providing access to all essential medicines and laboratory tests; providing basic emergency care; and creating an environment in primary care hospitals that is conducive to improving their utilization by patients and retention of health-care personnel, especially in rural areas. Each shared care cluster will be responsible for delivering the newly defined essential service package (ESP). Developed in 2018, this is the first comprehensive ESP in Sri Lanka, integrating into a single package the existing explicit, well-established suite of preventive services with a newly defined set of curative interventions to be delivered by the primary medical care institutions, and part of the secondary level of hospital care. In explicitly defining the primary care services that must be delivered to the whole population, the ESP informs the changes required in the various elements of the health system. Phased implementation of these health-system reforms by the government is now actively under way, with a national steering committee set up in 2018 to monitor the progress in implementation and provide overall oversight and guidance. Examples through which development partners, including the Asian Development Bank, World Bank and WHO, are providing support appear below. WHO is providing catalytic technical support on the health system work, such as for a health information system mapping and assessment, which will form the basis for developing the architecture of the health information system enterprise to monitor universal health coverage. The Asian Development Bank will support nine clusters in nine districts, mostly located in underresourced or rural areas. The World Bank is providing budget support to the whole country, in line with the goal of achieving a more people-centred and comprehensive model of primary health care service provision. The Global Fund to Fight AIDS, Tuberculosis and Malaria has recognized that a strong, resilient health system is needed to end HIV, tuberculosis and malaria, and has invested in technical catalytic activity for primary health care with WHO, for example a cross-programmatic efficiency analysis and development of the ESP service-delivery model; policy dialogue and provincial consultations on reorganization of primary health care; and health information system mapping. In Sri Lanka, what began as a search for primary care changes to address the burden of NCDs has evolved into a holistic model of primary health care that is people centred, integrated and equitable. Critical factors to realize the full potential of strengthening primary health care to accelerate achievement of universal health coverage in Sri Lanka are sustained political commitment, an effective communication strategy, a tailored health workforce policy, performance monitoring and evaluation, a coordination mechanism, and changes in administrative and financial regulations. Authorship: SP conceptualized the paper and drafted the manuscript; ON edited, provided technical input and coordinated the writing process; PdeS was involved in writing and review of the manuscript; CW was responsible for data collection and Box 1, and for review and obtaining agreement of all authors; RP undertook technical review of the manuscript. The World Bank. The World Bank in Sri Lanka. Overview (https://www.worldbank.org/en/country/srilanka/overview, accessed 22 February 2019). Health ….. the wealth of the nation. Performance and progress report 2016–2017. Colombo: Ministry of Health, Nutrition and Indigenous Medicine; 2018 (http://www.health.gov.lk/moh_final/english/public/elfinder/files/publications/2018/PPR_english2016-2017.pdf, accessed 22 February 2019). Sri Lanka – WHO. Country Cooperation Strategy 2018–2023. Colombo: World Health Organization Country Office for Sri Lanka; 2018 (http://apps.who.int/iris/bitstream/handle/10665/272611/9789290226345-eng.pdf?sequence=1&isAllowed=y, accessed 22 February 2019). Human Development Unit South Asia Region. Sri Lanka. Demographic transition: facing the challenges of an aging population with few resources. Washington (DC): World Bank; 2012 (Report no. 73162-LK; http://www-wds.worldbank.org/external/default/WDSContentServer/ WDSP/IB/2012/12/11/000425962_20121211165743/Rendered/PDF/ NonAsciiFileName0.pdf, accessed 22 February 2019). Non Communicable Disease Risk Factor Survey. Sri Lanka. 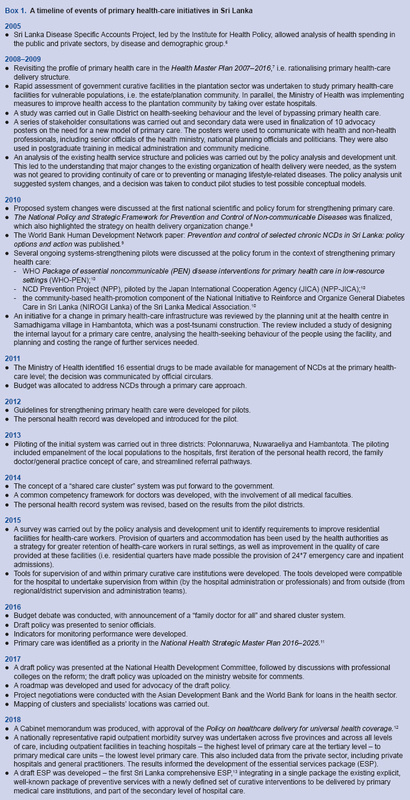 Colombo: World Health Organization and Ministry of Health Nutrition and Indigenous Medicine; 2015 (https://www.who.int/ncds/surveillance/steps/STEPS-report-2015-Sri-Lanka.pdf, accessed 22 February 2019). Institute for Health Policy. Sri Lanka Disease Specific Accounts (http://www.ihp.lk/research/project.html?project_id=HA-009, accessed 22 February 2019). Health Master Plan 2007–2016. Healthy and shining island in the 21st century. Annual Action Plan 2010 for programmes and directorates. Colombo: Ministry of Healthcare and Nutrition; 2010 (http://www.nationalplanningcycles.org/sites/default/files/country_docs/Sri%20Lanka/nhp_sri_lanka.pdf, accessed 6 March 2019). The National Policy and Strategic Framework for Prevention and Control of Chronic Non-communicable Diseases. Colombo: Ministry of Healthcare and Nutrition Sri Lanka; 2009 (http://www.health.gov.lk/enWeb/publication/Act/NCDPolicy-English.pdf, accessed 22 February 2019). Engelgau M, Okamoto K, Navaratne KV, Gopalan S. Prevention and control of selected chronic NCDs in Sri Lanka: policy options and action. Washington (DC): The World Bank; 2009 (http://siteresources.worldbank.org/HEALTHNUTRITIONANDPOPULATION/Resources/281627-1095698140167/NCDsSriLanka.pdf, accessed 22 February 2019). Mallawaarachchi DSV, Wickramasinghe SC, Somatunga LC, Siriwardana VTSK, Gunawardana NS. Healthy Lifestyle Centres: a service for screening noncommunicable diseases through primary healthcare institutions in Sri Lanka. WHO South-East Asia J Public Health. 2016;5(2):89–95. doi:10.4103/2224-3151.206258. National Health Strategic Master Plan 2016–2025 (draft). Volume IV: health administration and HRH. Colombo: Ministry of Health Nutrition and Indigenous Medicine; 2013 (http://www.health.gov.lk/enWeb/HMP2016-2025/Health%20%20Admin%20-%20%20HRH.pdf, accessed 21 February 2019). Policy on healthcare delivery for universal health coverage. Colombo: Ministry of Health, Nutrition and Indigenous Medicine; 2018 (http://www.health.gov.lk/moh_final/english/public/elfinder/files/publications/2018/Policyonhealthcaredelivery.pdf, accessed 22 February 2019). Essential (health) services package (ESP) for Sri Lanka. Justification, content and implementation arrangements. Version 2.2. 22/08/2018. Colombo: Ministry of Health, Nutrition and Indigenous Medicine; 2018 (http://www.health.gov.lk/moh_final/english/public/elfinder/files/publications/2018/SLESP%20version%202.pdf, accessed 22 February 2019). Report and recommendation of the President to the Board of Directors. Project no 51107-002 October 2018. Proposed loan and grant Democratic Socialist Republic of Sri Lanka: Health System Enhancement Project. Manila: Asian Development Bank; 2018 (https://www.adb.org/sites/default/files/project-documents/51107/51107-002-rrp-en.pdf, accessed 22 February 2019). International Bank for Reconstruction and Development Project appraisal document on a proposed loan in the amount of US$200 million to the Democratic Socialist Republic of Sri Lanka for a primary health care system strengthening project. Washington (DC): World Bank; 2018 (Report no. PAD2695; http://documents.worldbank.org/curated/en/306851530329751047/pdf/Project-Appraisal-Document-PAD-Sri-Lanka-Primary-Health-Care-System-Strengthening-Project-P163721-002-06082018.pdf, accessed 22 February 2019).